Microsoft kicked off their week at E3 in a big way during the Xbox E3 2018 Briefing. There were lots of surprises and big announcements as well as a Sea of Thieves trailer chock-full of teases of what’s to come in the near future. Alongside the trailer was an accompanying Xbox Wire article and a great interview in the first Inside Xbox broadcasting at this year’s E3. We have all the important details for you below! The trailer begins with some very impressive stats about the game since launch. 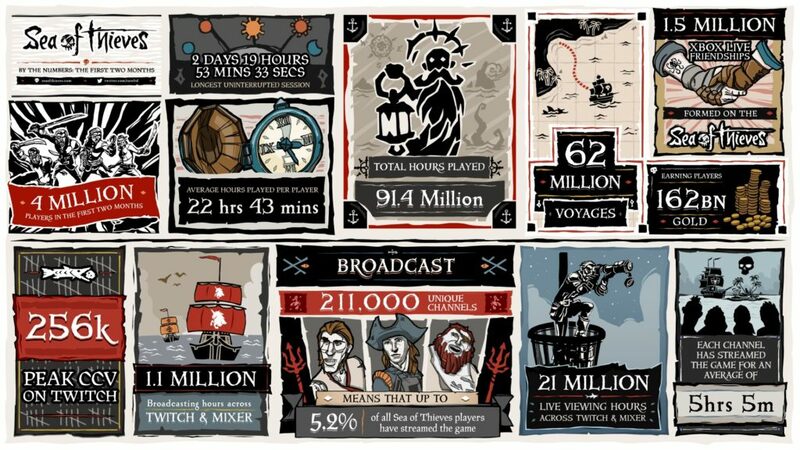 Sea of Thieves has had 4 million players that have accumulated 91 million hours of gameplay. During those hours, 1.5 million friendships were made. That is a lot of pirating! The trailer then shifts towards a nice cinematic showing what’s to come. A brand new cinematic starts with a pirate entering an Order of Souls tent in the middle of the storm. This pirate goes on to present Olwen of the Order of Souls a red orb. The red orb appears to have some kind of world inside of it. Olwen talks about a new land being revealed, the Forsaken Shores. 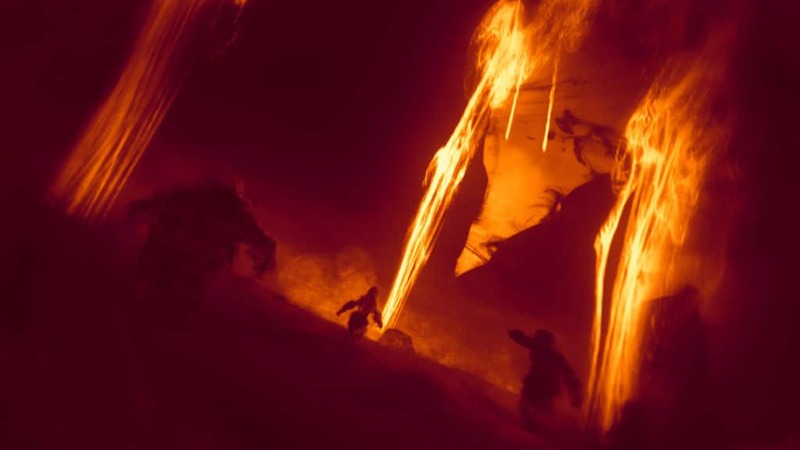 This land looks to be filled with fire and brimstone as volcanoes violently explode. She then goes on to explain that skeleton crews will rise up and sail the Sea of Thieves. We also get a glimpse of pirates sailing on a rowboat as well as a never before seen ship with only two masts. After she is done telling her story, we get release months for two new content drops. The Cursed Sails will be available in July of this year and The Forsaken Shores will follow in September. He then goes on to write that this is just the beginning. 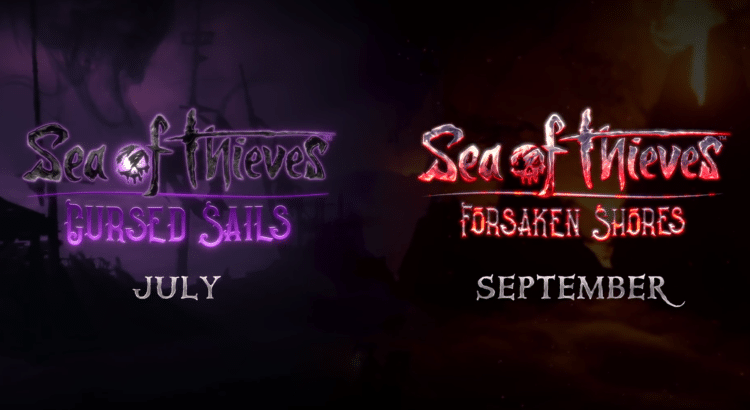 As shown in the trailer, players can expect two Content Updates due to hit in the coming months; Cursed Sails and Forsaken Shores. Similar to The Hungering Deep, the new content will open with a campaign to help familiarize players with the new content. The Cursed Sails will be bringing NPC controlled ships into the game for the first time. With the new NPC skeleton ships comes a three person ship to be controlled by the players, the Brigantine. The current sloop and galleon leave a desire for a mid-sized ship and the Brigantine looks to fill that empty spot. After players have conquered the new skeleton threat and mastered the new ship, they can look forward to another big content update that brings a new type of threat. If skeletons, sharks and a Megalodon were not enough, players will now have to fear the islands themselves. This new area in the world, Devil’s Roar, will present a whole new threat with volcanic rocks. It sounds like the rowboats will come in handy as you will not want to park your main ship close to one of these active islands. Those two content updates cover what is to come. But what about right now? Before all that though, we will be beginning our regular in-game events on June 12, when we introduce the time-limited Skeleton Thrones event to Sea of Thieves. The events will give players new goals and rewards on a regular basis, outside of our Content Updates and the time-limited campaigns that accompany them. The Skeleton Thrones event will have players explore the world for these tucked away thrones to gain experience and currency towards the new Bilge Rat trading company. This trading company will have cosmetics that can only purchased with the new Bilge Rat currency. This first event involving Skeleton Thrones will have players working together if they want to complete the event. Five of the ten thrones require more than one crew to gain the experience the throne has to offer. After the success of creating a friendlier Sea of Thieves during The Hungering Deep campaign, this latest effort to create a more co-operative experience will hopefully see the same results. Mike Chapman, Design Director of Sea of Thieves, gave a very informative interview covering the same topics already mentioned but seized the opportunity to give just a bit more detail. He started off talking about the Cursed Sails and the NPC controlled galleons. One new takeaway was confirmation that players will be able to practice their current strategies against player controlled galleons on these new NPC controlled ships. Along with the skeleton crewed ships, players will also see the introduction of cursed cannonballs. Examples of the possible curses were a cannonball that would make your ship ride lower in the water. This would lead to taking on water if you had any middle hull holes. Another cursed cannonball could cut all voice communication on the effected ship. The last example given was a curse that would force your character to start dancing. While dancing is always fun, it isn’t something you want to be doing as your ship is taking cannon fire and water. And that concludes our summary of the big Sea of Thieves blowout that started the impressive Microsoft showing at E3 this year.